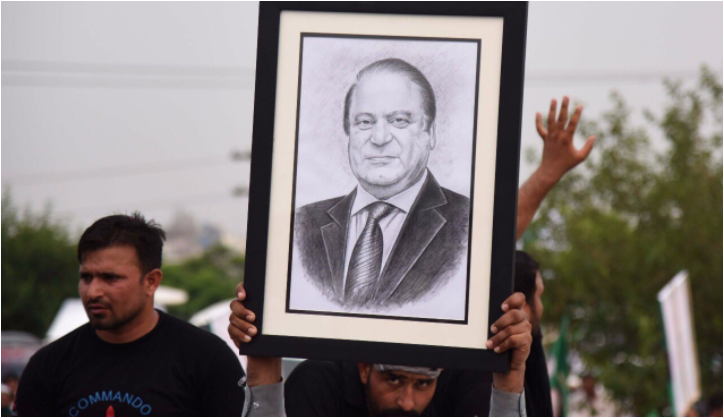 On Thursday the former Pakistan Prime Minister Nawaz Sharif began the second leg of his “homecoming rally” in Lahore via the Grand Trunk (GT) Road after an overnight stay in Rawalpindi. He began his journey on Wednesday morning from Islamabad and due to the massing of supporters on the way the rally could only reach Rawalpindi, 20 km from the capital, in 12 hours, Geo News reported. Sharif, however, was not happy with the number of supporters at the rally. Prior to his departure from Rawalpindi’s Punjab House, the former Prime Minister held a meeting with PML-N officials and expressed anger with the administration over the low turnout of supporters, Dawn newspaper reported. According to police officials, around 8,000 to 8,500 people and 900 to 950 vehicles had joined the procession. However, sources in the PML-N told the daily that the party failed to bring the desired number of activists on to the roads. An estimated 1,500 party workers were taking part in the procession on Thursday, the report said. In his late night address to his supporters at Rawalpindi’s Committee Chowk, Sharif called the apex court’s decision to depose him last month a “joke” and an insult to voters. Sharif sought the people’s promise to get their mandate respected. The former Premier said that he did not want their support for his reinstatement but for changing the destiny of the country. “The court of the people of Pakistan has given its verdict in my favour,” the PML-N leader said. “We have to make sure that the mandate of the people is respected in the future. We will do this in the interest of Pakistan,” he said, claiming that there was “not even a single allegation of corruption”. “If you do not protect your rights, they will continue to be snatched away from you,” Sharif told his supporters. His convoy includes senior party leaders Amir Muqam, Abid Sher Ali, Hanif Abbasi, Marvi Memon and Zaeem Qadri, among others. Former Interior Minister Chaudhry Nisar was conspicuous by his absence from the procession. The Rawalpindi traffic police made special arrangements to ensure that the rally passes through smoothly. Tight security was in place along the GT Road with the deployment of plainclothes policemen as well as Elite Force commandos, the report said. Sharif’s convoy is expected to move through Jhelum, Kharian, Lala Musa and Gujrat to Gujranwala and then move through Kamoke, Muridke, Kala Shah Kaku, Ferozwala and Shahdara to enter his hometown of Lahore.